Microsoft’s Windows Phones has always marched to the beat of its own drum. The first version of this OS, Windows Phone 7, launched in 2010 and took a completely different approach to the rows of icons and widgets found on Android and iOS devices. 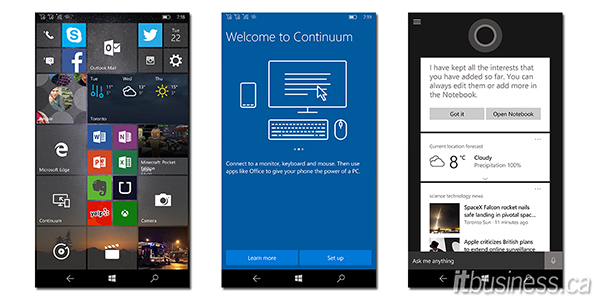 Instead, the home screen consisted of Live Tiles, a UI paradigm that has now spread to almost every corner of the Microsoft ecosystem. Unfortunately Windows Phone never really caught on, especially in Canada. Even after successive updates, and famed cellphone vendor Nokia making Windows Phone its OS of choice (before it was acquired by Microsoft) the mobile OS from Redmond just couldn’t seem to put a dent in the combined Apple and Google mobile juggernaut. Despite repeated promises, application developers never really got on board, and it became a vicious cycle. Each update to the OS improved it, yet without third-party developer support, interest in Windows Phone continued to shrink. Last year we looked at the Nokia Lumia 830, one of the last Windows Phones to be made available through carriers in Canada. Even though we did consider it one of the best business smartphones of 2014, especially for those heavily invested in Microsoft’s applications and services, we were also acutely aware of the application gap between Windows and other mobile OS’s. It was also a decidedly mid-range device when what Microsoft needed was a high-end halo device to showcase what Windows Phone could do. Well, after a long wait that device has come in the form of the new Lumia 950 XL, a premium device that can go toe-to-toe with the best Android and iOS phones on the market. 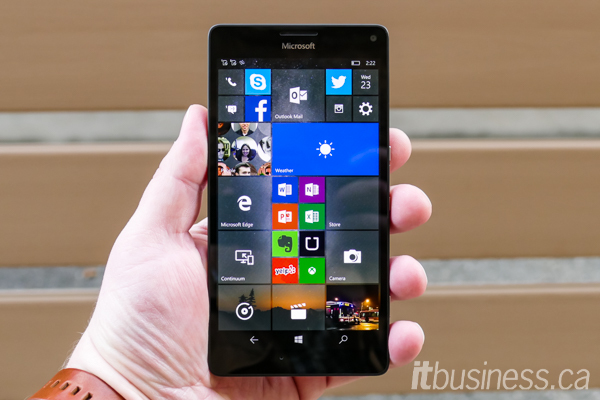 It is also one of the first phones to run Microsoft’s latest mobile OS, Windows 10. The Lumia 950 XL (along with its smaller brother, the Lumia 950) is the first new phone from Microsoft available in Canada for some time, and they are also the first premium Windows phones released anywhere in over a year. The last Windows Phone launched in Canada was the mid-range Lumia 640 XL (which like the 950’s, is only sold by Microsoft here) and the last Lumia to be sold by a carrier was the 830 last year. As for premium devices, the last high-end Lumia was 2014’s 930, a phone that never made it to Canada. Suffice to say, the launch of the 950’s in Canada is very welcome news. The 950 XL is also the first Windows phone that is fully competitive with its current rivals. Previous high-end Lumia’s were always slightly behind the performance curve, utilizing older SoCs than the best available. The 950 XL, though, uses the same Snapdragon 810 chip found in premium Android phones like the Nexus 6P and Xperia Z5. To deal with the 810’s notorious heat output, Microsoft has engineered the 950 XL with a heat pipe, a novel solution to what could have been a significant problem. In fact, when it comes to its hardware specifications, Microsoft almost threw everything and the kitchen sink into its latest phone. Along with the top-end SoC, the 950 XL has a 5.7-inch WQHD AMOLED display, 3 GB of RAM, 32 GB of storage (with a microSD slot), a big 3,340 mAh removable battery, a USB Type-C port, wireless charging, and a 20 MP camera. It also has dual SIM slots (an uncommon feature for a phone sold in Canada) allowing you to use one device for both a business and personal line. We can’t think of anything that Microsoft missed, and it’s also heartening to see that Redmond still believes in offering a premium device with expandable storage and a removable battery, features increasing rare on other vendor’s phones. 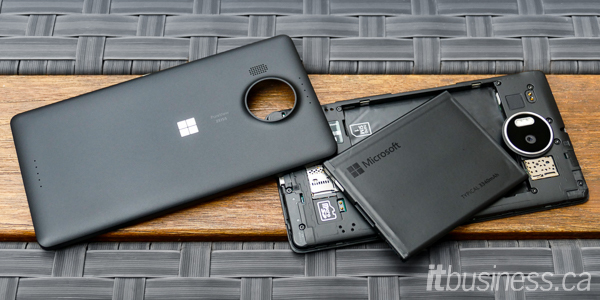 We were a little disappointed that its battery life isn’t as good as we’d expected despite its size – with heavy use we did get one day of life from it, but not the multi-day life we’d experience with previous Windows phones. The 950’s are the first Windows phones to be offered with super-crisp 2560 x 1440 Quad HD displays, and the XL’s doesn’t disappoint. It’s an AMOLED panel with ClearBlack technology (originally developed by Nokia) that acts like a polarizing filter to make the screen more visible outdoors. With the display being 5.7-inches the 950 XL is by no means a small phone, but its 74-percent screen-to-body ratio is decent, keeping it as compact as possible and comparable to other leading phablets. The 950 XL doesn’t have a fingerprint reader, a feature of many of its competitors, and at first, this would seem to be an oversight. However, instead, Microsoft has equipped it with an infrared iris scanner that works with Windows Hello, its new password-free Windows 10 authentication solution. The iris scanner works surprisingly well in multiple lighting conditions once you train it and is more secure than fingerprint scanning because your iris has more unique points of comparison. The only downside is that it sometimes takes a few seconds to recognize you and log in, which is a lot slower than fingerprint secured devices. 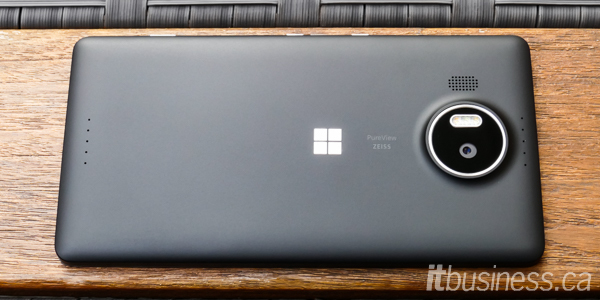 The one aspect of the Lumia 950 XL’s hardware that is a tad disappointing is its appearance. Although I appreciate understated design, I think perhaps Microsoft went a little too far making the 950 XL a nondescript black (or white) plastic slate. To clarify, we are not bemoaning the lack of premium materials like metal – previous Lumia’s have demonstrated that you can make an excellent product without using them, but nonetheless, it would have been nice to see the 950 XL available in some of the bolder colours of its older siblings. The removable back is also made of very thin plastic, and that feels like it will crack every time you take it off. At first glance, it doesn’t seem like anything has changed between Windows 10 and Windows Phone 8.1 (the last version of Microsoft’s mobile OS). The home screen is still a grid of Live Tiles that act as both icons to start apps and widgets that display live information from within the app. However, behind the scenes, this new OS is completely different. Windows 10 running on a phone uses the same codebase as Windows 10 running on your desktop, so there is really no such thing as Windows Phone 10. Consequently, that means the Lumia 950 XL can run the same Windows Universal Apps that run on any Windows 10 device with their appearance changing to fit the device’s screen size. This enables Microsoft’s unique Continuum feature, which we’ll look at below. Windows Phone has always been a very lightweight OS, so everything on it seems snappier than competing mobile OSs, and with each iteration, Microsoft has refined the experience. It has incorporated ideas from its competition such as a drop down Action Centre similar to Android’s notification panel, complete with quick settings buttons. Overall, the core OS experience on the 950 XL is excellent, and pre-installed apps like Outlook and Office are first-rate. Windows 10 also has an exceptionally good voice assistant/search tool in the form of Cortana. Unfortunately, when you step out of the confines of Microsoft’s ecosystem problems arise. Third-party application support on Windows 10 is still abysmal, with many leading apps either unavailable or substantially out of date when compared to the versions for other mobile OSs. Also, if your business runs on Google Apps, Windows 10 is probably not the best mobile OS choice, because you won’t find any official Google applications on Microsoft’s platform. Still, it’s early days for Windows 10, so there is a chance this situation could turn around, and third-party app support could increase substantially, but we’re not counting on it. Despite our reservations about third-party apps, Windows 10 is still full of unique innovations, the biggest being the visionary Continuum. 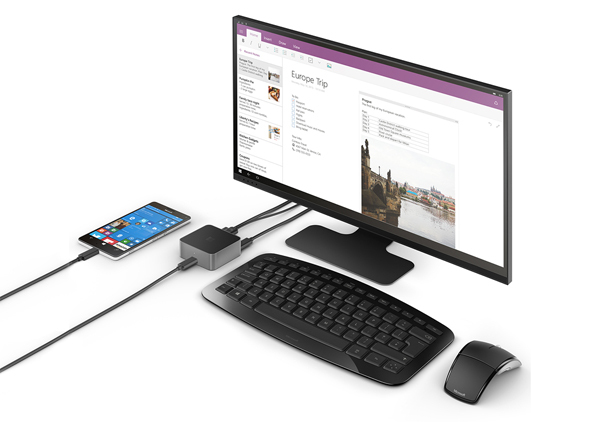 This allows you to hook up the Lumia 950 XL to an external monitor, keyboard and mouse (either wirelessly using Bluetooth and Miracast or wired using the Microsoft Display Dock and USB Type-C) and use it to run select Universal Applications (for example Office apps) in their fullscreen desktop mode on the larger screen. In a manner of speaking, Continuum transforms the 950 XL into a tiny desktop PC. Regrettably, we haven’t been able to test out this feature ourselves yet, but all accounts we have read say it works very well, but there is currently only a very limited selection of Universal Apps that can be used with it. Continuum is a potential game changer, but as it stands now on the 950 XL it’s more of a proof of concept, but we are excited to see where Microsoft takes this technology. 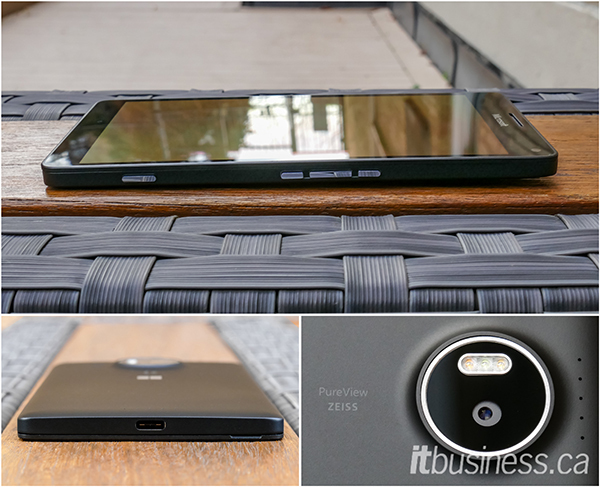 Lumia phones have long been famous for having excellent cameras that use the PureView tech developed by Nokia, and the 950 XL’s is no exception. Its specs compete with the best of other mobile platforms. It has a reasonably sized 1/2.4-inch 20 MP sensor that has OIS and is combined with f/1.9 Carl Zeiss optics. This means that the 950 XL performs well in low light. There is also a useful physical camera shutter button, a rarity on a modern smartphone. In addition to the good hardware, the 950 XL’s camera software is outstanding, with an easy to use interface, full manual controls and the ability to capture RAW images. It also has some unique features such as Lumia Rich Capture, which applies post-processing effects like HDR and stacks multiple images together to enhance your pictures. A few other features of the camera software are Live Images, which captures a short video that plays before the final image and Dynamic Flash. This takes multiple shots with the flash at different levels so you can tune how strong it appears in the finished picture. The quality of the actual images captured by the 950 XL is superb, and they have lots of detail, minimal noise and good dynamic range. 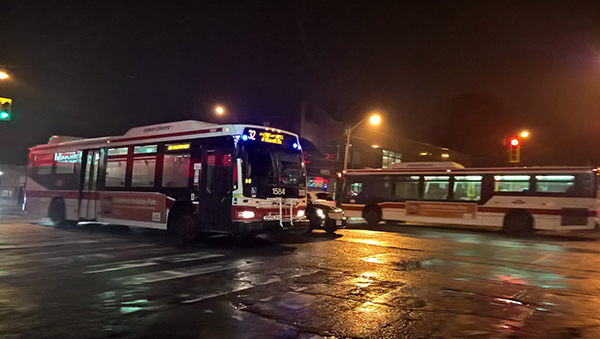 In low light, the Lumia also performs great and Rich Capture works as advertised, automatically improving the majority of the pictures we shot. On the other hand, the Lumia 950 XL is up against some very stiff competition in the smartphone camera space this year, and although its camera is one of the best we’ve tested, we do think there is a handful of phones that just slightly outclass it, one being the Galaxy Note 5. Although we didn’t test its video capabilities, we’d be remiss in not mentioning that the 950 XL can record 4K videos. The Microsoft Lumia 950 XL is definitely deserving of a spot on our 2015 top smartphones for business list notwithstanding our reservations about Windows 10 due to the continuing application gap. On the hardware side, Microsoft has finally released a device the meets and even surpasses the best Android and iOS phones available. The 950 XL is packed with features, such as a USB Type-C port, dual-SIM slots and an IR iris scanner, yet doesn’t forget key features that many other vendors long since have, such as removable batteries and storage expansion. Its camera is also excellent – perhaps not as good as the best the other ecosystems have to offer, but backed by some unique software features like Rich Capture. Windows 10 is also very impressive when running on a phone, and like the 950 XL’s hardware, it is packed to the brim with features like Cortana and the potentially revolutionary Continuum feature. This lets you hook up your phone to a monitor, mouse and keyboard and use select Universal Windows 10 applications in their full desktop mode. Microsoft’s Live Tile interface is as refreshing as ever and a much smarter way of presenting important information to you at a glance. Sadly, even with all these positives, the app gap soon rears its ugly head, and unless you are deeply invested in the Microsoft ecosystem, using Windows 10 on a phone is often going to be painful, especially if you use a lot of Google’s services. However, for business users, who likely work in an environment that is more Microsoft than anything else this might not be as big of an issue. The Lumia 950 XL is also quite expensive, well at least for a premium device running an untested operating system. $849 is probably a bit too much for someone to spend just to try a phone running Windows 10, and, unfortunately, buying it outright from Microsoft is the only way you can acquire it in Canada because no carriers have decided to pick up any of the new Windows 10 smartphones. The Microsoft Lumia 950 XL is available unlocked from the Microsoft Store in black or white for $849.